Car cleaning set. Great for cleaning different surfaces inside cards. Includes crevice nozzle, dusting brush, brush nozzle and rubbe nozzle. Features: Dusting Brush: 70mm wide. For dashboard, buttons and controls. Can be rotated. Rubber nozzle: 185mm long. 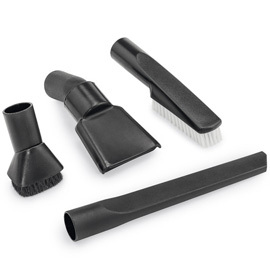 For vacumming car boots. Brush nozzle: 230mm long. For cleaning seats, carpets or other upholstered areas. Crevice nozzle: 300mm long. For cleaning hard-to-reach areas - between seats and in the foot well.